The Tube Collective says that "Amps built by the members of the Vacuum Tube Collective of Corvallis are pieces of folk art, built by hand one at a time out of old loudspeakers, old suitcases, and old vacuum tube amp chassis in order to get old tone. Each is unique- there are no standard models, types, or prices". 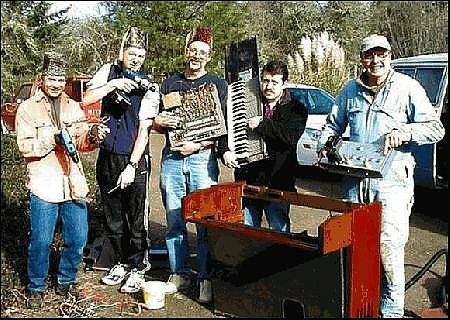 As the guys say themselves... "Interested in cheap fun, unique looks, and bruised tone, concocted out of found objects late at night by a demented garage hobbyist for his friends in his spare time, and sold with no strings attached for the price of a tank of gas, a quart of whiskey, and a cheap cigar? Do you want an amplifier that Does Not, And Will Not, Pay The Rent On Time? Do you want a Lo-Fi, Hepatitis-Carrying, Distortion-Filled, Gutter Budget Vacuum Tube Amp For Use By Dangerous Blues Men Who Eat Sixteen-Ounce Steaks And Come Home Late After Playing Ear-Searing Sump-Wash Grind-O-Matic Jump On Penicillin-Resistant Stratocasters With Most Of The Paint Missing In Cigar-Smoke-Filled Whiskey Bars For Ordinary People Who Think Tofu Is Whale Snot And The "Volvo" Is A Part Of The Female Anatomy And Who Drive 1974 Ford LTD Sedans With Peeling Vinyl Roofs, Rusted Out Wheel Wells And Broken Radios That Only Pick Up One Spanish Station? Then you should give one of our amps a try"